Prevalon Pressure-Relieving Heel Protector helps minimize pressure, friction and shear on the feet, heels and ankles of non-ambulatory patients. It completely off-loads the heel to deliver total, continuous pressure relief. It maximizes support under the foot helping prevent plantar flexion contracture (foot drop), and also helps prevent lateral foot and leg rotation. Stretch panels adjust in seconds for a secure, comfortable fit. The smooth outer covering of ripstop nylon repels liquids and makes Prevalon easy to wipe clean. AllegroMedical.com presents The Prevalon Heel Protector. 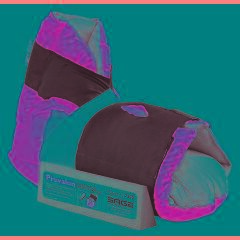 Prevalon Pressure-Relieving Heel Protector helps minimize pressure, friction and shear on the feet, heels and ankles of non-ambulatory patients. It completely off-loads the heel to deliver total, continuous pressure relief. Open floated heel. It maximizes support under the foot helping prevent plantar flexion contracture (foot drop), and also helps prevent lateral foot and leg rotation. Stretch panels adjust in seconds for a secure, comfortable fit. The smooth outer covering of ripstop nylon repels liquids and makes Prevalon easy to wipe clean.